Has your organisation embraced the latest virtual collaboration tools? Perhaps you are seeing the emergence of new behaviours at work? Whatever the change in your organisation, it is safe to say that smarter working is on the rise. 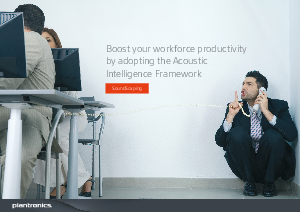 But smarter working brings its own acoustic challenges. Unwelcomed workplace noise disrupts concentration, decreases productivity and increases stress amongst your associates according to a recent University of California study. This paper illustrates the best Plantronic audio solutions for your business. Download this paper now to find out how to find the right technology for you.